Today is the last day of the Pollution Pods in Trondheim. If you haven't had the chance to visit the artwork yet - this is your last chance. Use the nice weather and combine a walk through Festningsparken with a friend, your boy- or girlfriend or your family. Pollution Pods is an experience for everyone! The installation is open until 20.00 o'clock. there will be a Frisbee golf tournament going on this weekend in the same area the pollution pods are. The main footpath to the pods is open, but many paths in the park will be closed. Be careful not to be hit by flying objects when you visit us. Meet Our Scent Expert - Jorg Hempenius! Jorg is specialized in the creation of smells, particularly for artworks and he has already done some impressive work for other exhibitions. For example, he created smells for the Stedelijk Museum and the Van Gogh Museum in Amsterdam, the BDMuseum and Museon in the Hague, and the Van Abbemuseum in Eindhoven. He also works with special scent equipment that help distribute the scents in an optimal way for the best experience. We are very happy and lucky to have Jorg on our project. He created the smells we needed for Pollution Pods in record time (just a few days) and with immaculate precision. Adding smells to artworks adds another dimension to it; another layer. Our sense of smell is an important component for our survival and it has evolved over thousands of years to carry messages and act as a form of communication. For example, smells can help us distinguish which foods are edible or safe, whether there is a fire or whether the ocean is nearby. Smells therefore also influence our thoughts, associations and emotions, even when we don't always realize it. The scents that Jorg has created for our project are not necessarily pleasant ones, because the artwork is about human impacts on the environment. Some of the smells also occur naturally while others are completely man-made, but the reason the selected smells are featured so prominently in the locations we have selected for the pollution pods is due to human behavior in every case. Come and experience the smells for yourself and see what effect it has on you. We would love to hear your thoughts as well! The last few weeks have been very busy, in preparation for the opening of the exhibition for Pollution Pods. Specifically, we have been struggling with how to recreate the smells for the different cities in order to get the most realistic representation of the experience of pollution around the world, without exposing people to harmful toxins. While doing research I came across Javier Sempere on Quora where he answered questions about the creation of smells. He is a scent expert based in Madrid, Spain. I contacted him and he answered all my questions in detail about the different methods with which the smells can be created, and gave me valuable advice on how we could do some experiments ourselves for the creation of the smells. From this moment on it was clear to me that we needed to hire a smell expert for this project to make the exhibition truly unforgettable. Unfortunately, due to time constraints and possible issues with shipping and importing the final products into Norway (which is always very complicated) we had to opt for a scent expert who was based closer to Trondheim, because the final product would have to be picked up in person and transported back overland. Nevertheless, Javier helped me to get started on the right idea to solve our issues with the creation of the olfactory experience for Pollution Pods and pointed me in the right direction. And for that I would like to say thank you! Igloo-like domes of polluted city air set up in Trondheim this summer. The goal is to get people to think more about the environment. Watch a short video preview of Pollution Pods put together by NTNU here. A research project allows visitors to experience the differences between heavily polluted Delhi-air and fresh air from the Norwegian countryside. The Climart team have just spent the week, setting up a single pod and working with Matthias Vogt from NILU to understand how the pollution cocktails will work out of the lab and in a tent-like environment in Trondheim. Our noses because quite easily desensitised to the smells, so it was important to call in other people to experience the pollution. Climart are delighted that Airlabs will bring their expertise to team to provide a specially tailored filter for the entrance dome of the Pollution Pods which will emulate an unpolluted site in the northern wilderness of Norway. Airlabs are producing street furniture which cleans polluted air. They will be installing bus stops in Oxford Street, London which will allow public transport users to breath much improved air whilst waiting for buses. The Climart team presented a model of Pollution Pods at the Omstilt conference in Oslo on February 9, 2017. It was a great opportunity to discuss the project with a broad and informed audience. The team are particularly grateful for the help from Chris at Build With Hubs who detailed and modelled the design of the geodesic domes. The Climart team are delighted that the Pollution Pods installation will be launched at the Starmus festival in Trondheim June 18-23, 2017. The Starmus Festival was born to celebrate science and the arts with the goal of bringing an understanding and appreciation of science to the public at large. Starmus IV in Trondheim is going to be the biggest Starmus festival yet: an international star-studded gathering of scientists, artists, musicians, writers, business leaders, and more; all coming together to celebrate science. It will be an exciting festival of talks, concerts, debates, parties, and learning. Confirmed speakers include: Stephen Hawking and Buzz Aldrin. We had a good day out at the headquarters of Build With Hubs build a 3V geodesic dome with their hubs for the first time. Build With Hubs had designed the hubs to construct 2V domes so we needed to check their strength to support a frame which is almost twice as heavy as its 2V counterpart. The wood has been cut to keep the bark visible on the outside of the frame and cut wood visible from the inside. The Climart team are excited to welcome the Norwegian Institute of Air Research as collaborators within the Pollution Pods project. Their team of scientists are going to create the chemicals and the systems to emulate the polluted air in cities around the world. Presently we have chosen recreate the polluted air from cities of London, Delhi, Bejing, Cairo and San Paulo. Beautiful Brighton by the sea was the venue for the annual Climart project meeting. ONCA, a local environmental gallery and grass-root space already hosted one of the big Climart data collections. Therefore, the frame was set for the team to discuss the achievements and challenges of the second project year. The PhD researchers presented their work and Michael Pinsky, the commissioned artist, presented his project ideas. Lively discussions led to clear milestones and exciting plans for the next year. A final decision was made to pursue the Pollution Pods concept. The Climart team met in Trondheim to discuss Michael's initial proposals. After much discussion the team decided to carry on developing two proposals, Pollution Pods and the On-lines auction to test which would be the most viable. Below is a selection of the proposals. Extreme heatwaves and heavy rain storms are already happening with increasing regularity worldwide because of manmade climate change. Global warming over the last century means heat extremes that previously only occurred once every 1,000 days are happening four to five times more often. One in five extreme rain events experienced globally are a result of the 0.85C global rise in temperature since the Industrial Revolution, as power plants, factories and cars continue to pump out greenhouse gas emissions. The number of extreme weather events are predicted to increase into the future. Weather Gone Wild transposes us from the present day to a moment in the 22nd Century when climatic diversity will have increased by twenty percent. Within a chosen bus shelter the visitor’s acoustic experience of the current weather conditions will be subtly exaggerated. When it rains a little, the sound of rain will pound the roof of the structure; when it rains a lot, the visitor will experience rolling thunder in the distance; when there is a breeze, strong winds will ripple through the tree tops and­­ as the temperature starts to rise, the listener will hear crickets and Mediterranean birds. These sounds will blend with the real sounds already present in the environment to create a convincing sonic environment. Speakers will be dispersed across the internal frame of the structure to create a three-dimensional soundscape. The weather conditions will only be exaggerated to the extent that the visitor’s visual and aural experiences will be readable as a whole so the visitor will not be able to distinguish between the real and the augmented sounds. 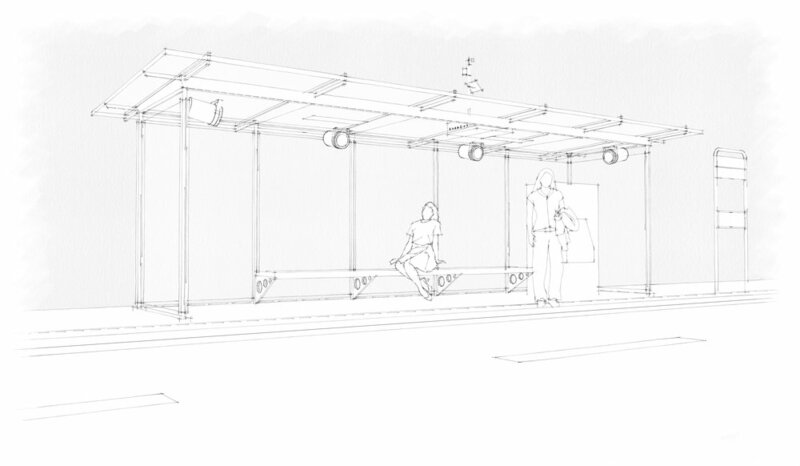 A weather station will be located on top of the bus shelter which will activate prerecorded weather sounds, so the sonic response to the current weather conditions will be localized to structure. As soon as a few rain drops hit the shelter the sound samples will change accordingly. Each month an advert in the Trondheim Press will ask for specific items to auction. Chairs, fridges, washing machines, computers, curtains, bicycles, red objects, round objects, small objects, transparent objects, illuminated objects...will then be collected. There is nothing unusual about this process, niche auctions have existed for years. But in this case, these objects will undertake a journey, which will transform them into a meanwhile sculptural form before being sold to the highest bidder. These objects will be suspended at the height of their reserve price until the open- ing of the auction. This sculpture will draw its aesthetic allure from the subtle and not so subtle differences between these objects, which share the same classification. After being observed for a week, the sale will begin and the objects height will rise or lower depending on the values of the bids. Electronic motorised winches will be directly linked to the auction site on- line allowing the objects to automatically controlled. This event conflating the commercial with the cultural, will encourage the people from Trondheim to circulate objects they no longer need, promoting an economy of reuse. Finally, the objects will be removed from their elevated positions and taken away by their new proud owners. An empty space will await the next wave of objects, sellers and buyers. Climate Change Incubators is a variant of the previous proposal also allowing the viewer to understand the impacts of climate change across chosen sites in Trondheim. Three geodesic domes will be erected over an area of fallow land within the city. The first dome will be heated to maintain a temperature two degrees above the current outdoor temperature, the second will be cooled to maintain a temperature two degrees below the current outdoor temperature and the third will remain consistent with the outdoor temperature. Either the pods will cultivate the pre-existing land or could be planted with seeds contributed by local schools, gardeners and residents. In either case, the land and the planting within all three domes will need to be as identical as possible. Each week a camera built into the dome will photograph the plot and automatically post the images on Instagram so partici- pants can view the growth of their seeds remotely. The transition in Europe from the produc- tion of goods, to the production of media content creates the illusion that we are us- ing less of the world’s resources. It surprises many people to learn that each single search action in Google uses as much ener- gy as making a cup of tea. Media content is now broadcast on a multitude of networks and appears magically on the customers’ screens, whether this takes the form of a phone, computer or television set. In the past, televisions were crafted to look like other furniture, but over the years the mass of this equipment has dematerialised until now it can be as thin as an i-pad or as intangible as a projection. Meanwhile, the rejected, but fully functional, cathode ray tube televisions sit dormant with their owners too embarrassed to throw them away. With an estimated 20+ million un- used TVs and computer monitors already in our homes and offices, initiatives are being introduced in an attempt to prevent old electronics ending up in landfills. Nulife Glass’s CRT recycling furnace technology can process the glass from approximately 60 tonnes of televisions a day. The recycling furnace extracts the toxic lead from the glass in a safe and environmentally sustainable way. The process has no emissions, creates no waste and avoids export of hazardous material around the globe. A record amount of electrical and electronic waste was discarded around the world in 2014, with the biggest per-capita tallies in countries that pride themselves on environmental consciousness. In 2013, the e-waste total was 39.8m tonnes – and on present trends, the 50-million-tonne mark could be reached in 2018. Topping the list for per-capita waste last year was Norway, with 28.4kg (62.5lbs) per inhabitant. Act I Adverts will be put in the Trondheim press and invitations will spread through the web asking people to donate their televi- sion sets to the project. These sets will be collected. Media students from Depart- ment of Art and Media Studies at NTNU will document the process of this collection and the stories which lie behind the televi- sion sets. Act II A series of geodesic domes will be con- structed and the televisions will be embed- ded into their frameworks. These domes will float in Trondheim’s quays. Whilst the water is still, the reflections of the domes will make these objects appear as globes. The student documentaries will be broad- cast on the screens. Act III The domes will be dismantled and the televisions brought to Nulife Glass to be processed. The glass recovered from the televisions will be used to make a perma- nent intervention within Trondheim. For perpetuity, participants will be able to see the results of their contribution. In the UK, the introduction of a payment for plastic bags had a huge effect in reducing the number of bags being produced and disposed of. In Norway this payment is seen as just another tax and has not put Norwegians off buying the bags. The prints on these demonstrate the possible outcomes for the bags if they enter the eco-system. I was quite astonished to be shown what appeared to be picture book Scandinavian wilderness only minutes away from the centre of Trondheim. Within half an hour a visitor could either be on the banks of a seemingly tranquil and untouched lake deep in snow, or on a rainy quayside development full of fashionable bars and shops. I thought this could give an opportunity for an exchange, to play with our preconceptions and our clichés. Other conversation revealed that, contrary to my impression that Norwegians were law abiding citizens with huge civic pride, Norwegians did in fact have the same habit as other Western mortals who love throwing objects into the docks, canals, rivers and lakes. This led me to consider a project which would recover the jettisoned objects from the docks of Trondheim and recover the mostly natural matter from the lakes around Trondheim, such as Lianvatnet. These recovered objects would then be swapped from either their urban or rural location and mounted and illuminated within the water at their new location. This emergence from the water of the ‘other’ suggests a major reconfiguration of the land, a place where nothing is what is seems and nothing is where it should be. This uncanny conflation maintains an unsettling uncertainty, as if we can never be sure of where we stand or where we should stand. Snow is hugely important to the Trondheimers. In the winter many ski to work and take great pleasure in winter sports and activities, making the long winters bearable. Given its northerly location, the winter changes in temperature have a profound visible impact on the land and cityscape. 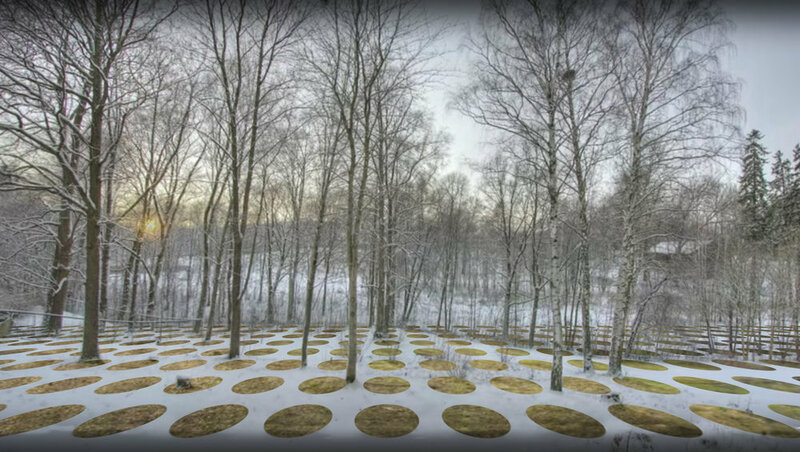 it starts to snow in November/December the pattern will invert appearing as a grid of circles maintained with no snow across the ground. The circles or holes suggest a certain permeability between our current time and a future time; a net that allows us to traverse the multiverse. The average temperature in Trondheim is between plus four degrees and minus four degrees from late October until the end of April, which allows a possible installation period of seven months. As part of its work at COP21 in Paris, Climart researchers are pleased to announce that Helene Rouchard of France was the winner of a lottery for those that responded to the questionnaire handed out by researchers. Participants offered a choice between three prizes, and Rouchard chose a donation to Friends of the Earth in the amount of €550.